When a chicken was roasted on a hot day earlier this week, the planned side dish of sauté greens would’ve been overwhelming. 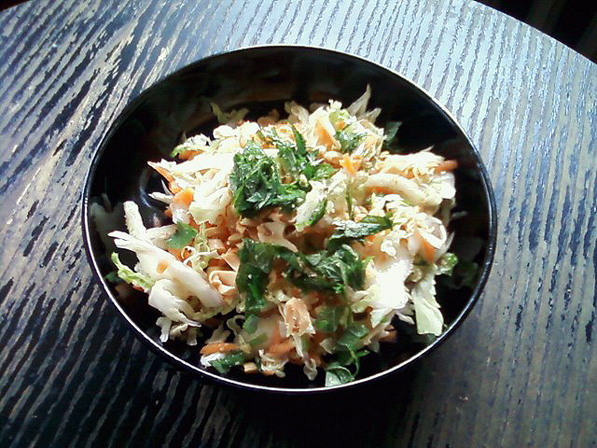 Thanks to a weekly menu plan, Napa cabbage and carrots were shredded a few days prior. A quick vinaigrette of ginger, savory soy sauce, sweet lime juice and fresh lemon balm was tossed with the shredded vegetables. Like most large heads of cabbage, there was plenty of salad left over. It became another side dish that completed a fast and effortless weekday meal of saute fish. Visit www.MyLifeRunsOnFood.com to read more.